I am a huge fan of the software that you produce.I have used quite citations functions. However, I would be able to group the citations, and all knowledge itens, per author in the knowledge section. When we have numerous quotes, to manually create the categories does not help in the process of organizing knowledge. That is, instead of using only the default categories, will be much more useful to use the names of the authors as grouping criteria. Other filters are also very welcome, such as the powerfull filter option at the main interface! I apologize for my bad English. Many thanks for space for discussion and the excellent work of you. I realized that this filter function has been enhanced in version 5. However, it is not able to automatically arrange items by author. I believe that should not be difficult to implement this filter view taking into consideration the latest application architecture. This will be particularly useful when the project have more than 2,000 authors, with at least 5 citations each. I also attached an example of "automatic category" by author. Am I correct in assuming that you would like to display the knowledge items by title rather than by author in the main programme, too? What is it that you want to do with such a view? I would like to ask you to explain this a little bit, because maybe there is a way to achieve this already. 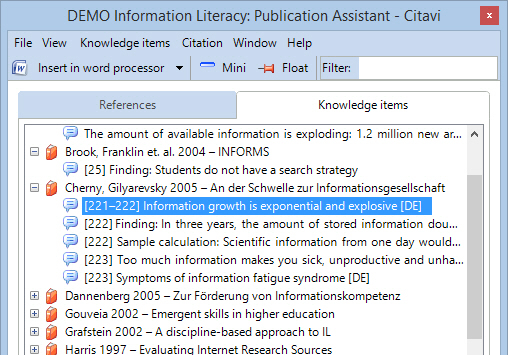 Is this short title view in the Knowledge section in the Word Add-In present also in version 4.5? I uninstalled the version 5. 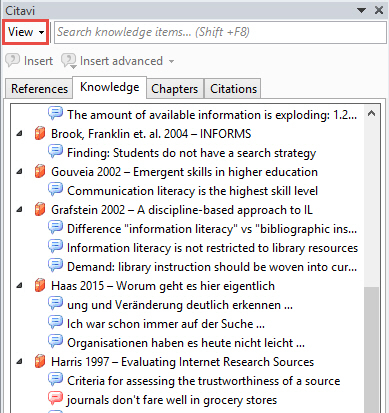 As I said, currently, in the main interface, I can not easily distinguish between citing several authors or titles without using manual categories. When you have more than 1000 citations, it becomes impractical to categorize them manually. You are right, I want to be able to see this kind of view in the main interface in order to better organize, study and review a lot of content, besides the manual "category" view. Is that possible? No, this is new in Citavi 5 which is going to be released soon. 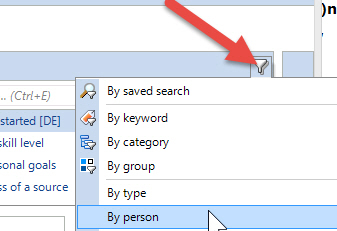 There is going to be a group feature in the knowledge organization which will allow for a further grouping of items based on searches. This might do for you. However, I have entered your wish into our features database. I did a little drawing of how the interface can become more organized by work / author. Another suggestion = add the batch creation of categories based on the names of the works or authors. Why do you want to create a category for every author? Patrick, thanks for the reply. It really is a significant improvement to organize a lot of items. However, it is not very intuitive. I believe that these suggestions are not only for myself, but for the best collective use. That, in the case, involves a more intuitive interface. In this sense, I believe that it is better to offer more ways to organize knowledge - assuming that we desire some automated functions, not mechanical.